Are you making these top pool care mistakes? There are simple and easy ways to keep your pool in good condition, but did you know you could accidentally be making some very common pool care mistakes that are damaging your pool? Running your pool pump less may help reduce your electricity bills, but if it does not run enough, you could end up paying more for maintenance and chemicals. Stagnant pool water increases the chance of algae growth. Algae can turn your water green and will be harder to clean. To keep energy costs low, consider installing an energy efficient pump. Find out more about these in our blog: Own a pool? This tip could save you $750 a year. Vacuuming helps remove debris from your pool, however, it will not remove all bacteria and algae. Scrubbing and brushing the walls and bottom of your pool will not only make your pool look brighter and cleaner, it will keep the water healthier too. If dog hair and dirt is left in your pool water, it can imbalance the water and cause an algae infestation. Dog hair can also clog the filter, meaning the water is not being cleaned properly. If your pet goes for a swim, run the pump for a bit longer, give the pool a brush down and a vacuum, and test the water will help avoid these issues. Regular water testing helps keep your pool water clear and healthy. It also means that you can pick up on any imbalances in the water before they become huge issues – this can save you a lot of time and money in the long run. Take your water sample down to your local Poolwerx for a free 60 second water test or you can call your nearest Poolwerx team and have a technician come out and test the pool water. A fortnightly water test is sufficient when your pool is not in regular use, however if you use your pool regularly, particularly in the warmer months, it is worth testing your pool water weekly. ‘Shocking’ is when chlorine or non-chlorine chemicals are added to your pool to raise the “free chlorine” level to a point where contaminates such as algae, combined chlorine (also known as chloramines) and bacteria are destroyed. For best results, avoid shocking your pool when it’s too hot as higher temperatures can increase the evaporation of your non-chlorine or chlorine shock. It can be difficult to know what your pool needs all the time. 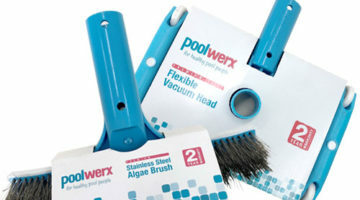 The expert team at Poolwerx specialises in pool and spa care and can help keep your pool sparkling year-round. Find your local Poolwerx and give them a call today.